Based on the 2017 A.V. Elliott Conference on Great Books and Ideas, this volume gathers ten scholarly essays on the great Athenian historian, Thucydides, and his influence on the founders of the American republic. 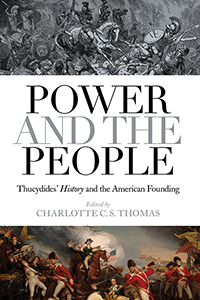 Contributors explore Thucydides’ insights into the challenges of democratic governance, especially for a wealthy and powerful state, what they meant to the American Founders, and why they continue to be relevant today. James Madison had at least four versions of Thucydides’ HISTORY in his library, and he recommended that his ten-year-old son read them all. He advised him, in particular, to read Thucydides in his original language. Thomas Jefferson, in his retirement, writes that he spends his free time playing with his grandchildren and reading Thucydides. The characters and episodes of Thucydides’ account of Athens’ downfall to Sparta in the Peloponnesian War was important, beloved, and apparently present in their lives from childhood to old age. In this volume contributors address, from many different angles, why this was and how an understanding of Thucydides should inform our understanding of our founding. Contributors include: Clifford Orwin (University of Toronto), Karl Walling (U.S. Naval War College), Steven Forde (University of North Texas, retired), Allison Levy (St. John’s College), Ann Ward (Baylor University), Norman Fischer (Clark Atlanta University), Bernard Dobski (Assumption College), Devin Stauffer (University of Texas), Sarah Gardner (Mercer University), and Laurie M. Johnson (Kansas State University).